Scroll down to the Course Administration block and click on Backup. 3. The default settings include everything in the backup file, including enrolled users. 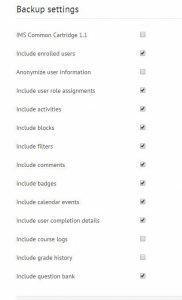 Since you are transferring content, you’ll want to uncheck include enrolled users. 4. The next step gives you a breakdown of all content being transferred. If you want to review these settings or choose only some of the content, click Next. It should be noted that Turnitin assignments should NOT be ported from one course to another. 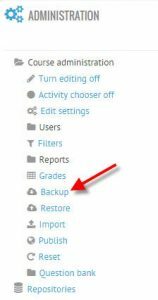 If the course you are backing up includes Turnitin Assignments, do NOT click Jump to Final Step, but continue on to step 5 to select items not to include in the backup. If you want all of the content, click Jump to Final Step (this begins the backup process automatically). 5. If you click Next, review the content, uncheck what you don’t want and continue clicking Next until you get the Perform Backup button. 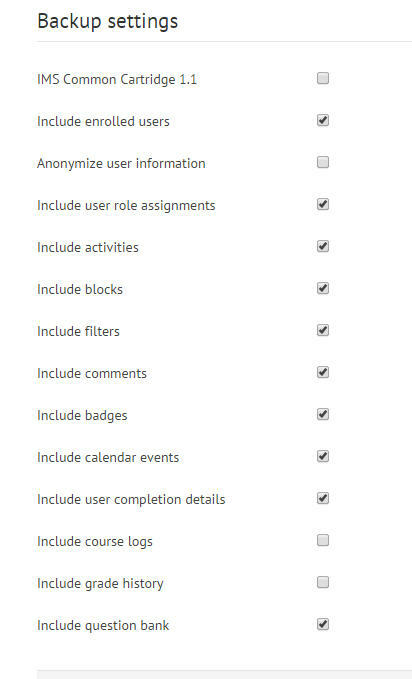 (If you have Turnitin assignments in the course you are backing up, please uncheck those items prior to clicking Next. 6. Once the backup is complete, you will see a screen indicating the backup is complete. Click continue, which will take you to the course backup/restore area. The final step is to download the backup you just created in order to restore it on the other server. Find your backup file lower down on the page – it will be time stamped and have an auto-generated filename which includes your course name. (If you chose not to include enrolled users in your backup, the backup file can be located under User Private Backup Area. 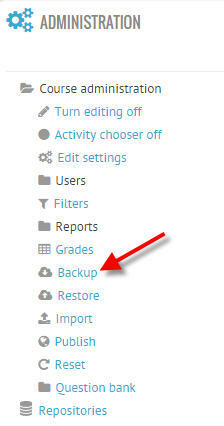 If you left user data in the backup, it can be found under Course Backup area). Click download and save the file where you can find it in a few moments. Next, we’ll move to the Current Moodle server to restore the course. Click into the course you want to transfer the content into. 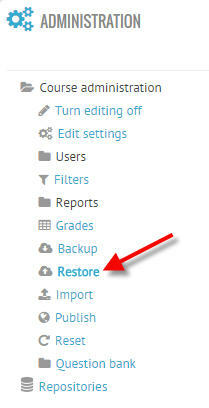 Scroll down to the Course Administration block and click Restore. 3. In the box that appears, you can either drag the backup file you just downloaded into the box or you can use the file picker to locate the downloaded backup. 4. You will see a list of items that will be restored. Scroll to the bottom of the page and click Continue. 5. Select Restore into this course option and choose either Merge the backup into this course or Delete contents first. (Unless you previously had material in your course on this server that you want to get rid of, usually you’ll want to just choose Merge. 6. You will see a summary of what will be transferred into this course on the next page. Click Next. 7. **IMPORTANT STEP** Naming the course – the default when restoring a course is the name of the backup course you are restoring. You need to change this to reflect the name of the course as it should be. (i.e. backup was CHE-241-a-SP-2017 –> course name needs to be changed to CHE-241-a-FA-2017). Change this in both the course name and the Course short name. 8. Once the restore is complete, you will see a screen indicating it completed successfully. Click Continue to go to the course.